For other uses, see Pirog (disambiguation). 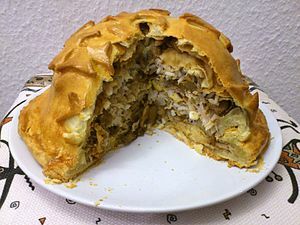 Pirog (Russian: пиро́г, IPA: [pʲɪˈrok] ( listen), pl. pirogi пироги [pʲɪrɐˈɡʲi]; Belarusian: піро́г; Northern Sami: pirog; Latvian: pīrāgs pl. pīrāgi; Ukrainian: пиріг pyrih, pl. pyrohy пироги) is a baked case of dough with a sweet or savoury filling. Pirogi are common in Eastern European cuisines. Pirogi are characterised as "the most popular and important dish" and "truly national goods" of Russian cuisine, "ubiquitous in Russian life". The name is derived from the ancient Proto-Slavic word pir, meaning "banquet" or "festivity". The Russian plural pirogi with the stress on the last syllable should not be confused with pierogi (stress on "o" in Polish and English) in Polish cuisine, which are similar to the Russian pelmeni or Ukrainian varenyky. Pirogi come in different shapes and forms: they are often oblong with tapering ends, but can also be circular or rectangular. They can be closed or open-faced with no crust on top. Pirogi are usually made from yeast-raised dough which distinguishes them from pies and pastries common in other cuisines. In former times, the dough for Russian pirogi was made predominantly of rye flour. Later it was mixed with wheat flour. Nowadays, mainly wheat flour is used. There are also variants made from shortcrust, flaky or puff pastry. In East-Slavic languages pirog is a generic term which denotes virtually any kind of pie, pastry, or cake. Тhus, Karelian pastry (known as Karelian pirog in Russian), knish or charlotte are considered types of pirog in Eastern Europe. The filling for pirogi may be sweet and contain quark or cottage cheese, fruits like apples, plums or various berries, as well as honey, nuts or poppy seeds. Savoury versions may consist of meat, fish, mushrooms, cabbage, rice, buckwheat groats or potato. In Ukrainian and Russian cuisines, pirogi (as well as their smaller versions called pirozhki) with a savoury filling are traditionally served as an accompaniment with clear borscht, broth or consommé. 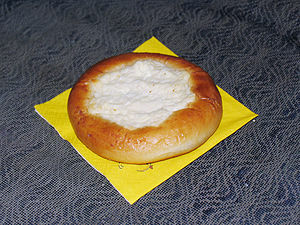 Vatrushka, a small sweet pirog, popular in all Eastern Slavic cuisines, formed as a ring of dough with quark in the middle. Similar West Slavic pastries, such as Czech and Slovak Kolach, and Polish Kołacz, usually have sweet fillings. Wikimedia Commons has media related to Pirogi. ^ Madison Books; Andrews McMeel Publishing (1 November 2007). 1,001 Foods to Die For. Andrews McMeel Publishing. p. 280. ISBN 978-0-7407-7043-2. Retrieved 8 February 2011. ^ Ekaterina and Lludmila Bylinka (2011). Home Cooking From Russia: A Collection of Traditional, Yet Contemporary Recipes. Authorhouse. p. 94. ISBN 9781467041362.